This is about public opinion and public perception as it relates to public policy (see previous posts). I also include some analyses of the opinions of politicians as it relates to public opinion or rather their perception of what they think or want to believe about the public (for background, see here and here). Asked which was more important, keeping crime rates down or reforming stop and frisk, 62 percent said keeping crime rates low and 30 percent said reforming stop and frisk. The article itself isn’t important. There are thousands like it, but I wanted to use it for the polling data it was using. I don’t know of any bias from Quinnipiac, beyond a basic mainstream bias, and so maybe the wording of the question was simply intellectual laziness. It was phrased as a forced choice question that implied choosing one negated the possibility of the other and it implied those were the only choices for public policy. I looked further into data related to stop and frisk. It isn’t as simple as the forced choice presents it. For one, a number of studies don’t show that stop and frisk actually keeps crime rates low, as the question assumes. Secondly, when given more information and more options, Americans tend to support funding programs that either help prevent crime or help rehabilitate criminals. The general public will favor punishment, when no other good choices are offered them. Still, that doesn’t say much about the fundamental values of most Americans. I’m not just interested in the answers given, but also the questions asked, how they are framed and how they are worded. All of this and more is detailed in the following and in Part 2. There is substantial evidence that political leaders misperceive the public mind on crime and justice issues.l Moreover, these misperceptions appear to be in one direction: that of assuming that citizens are more conservative and resistant to innovation in criminal justice than they actually are. These errors dampen imaginative thinking about crime control policy, cause premature rejection of promising policies and programs, and make certain policy options (cg, decriminalization of some offenses) taboo subjects. Surveys in the United States, Canada and Australia have consistently found that the public has an inaccurate and negative view of crime statistics, including the general beliefs that the crime rate is rising dramatically and that a high percentage of crime involves violence (Roberts 1992; Roberts & Stalans 1997). Similar findings have also been reported in Britain (Hough & Roberts 1998). The change in attitudes experienced as a result of the deliberative process remained stable 10 weeks later. What does all this mean? Although these results are not generalizable to the public at large, they do provide some insight into the differences between public opinion and public judgment as sources for criminal justice policy-making. When asked to answer a survey, people express their views on a topic they may or may not know something about. If they know something about it, that information may be based solely on what is reported in the media. Maybe respondents never even thought about the topic until they were asked to answer the survey. In deliberative polls, people receive balanced, scientific information about the different aspects of the issue at hand and they are provided an opportunity to think and discuss. Whatever their views on the subject may be, they reflect a carefully considered opinion. In those cases in which legislators are willing to take into account public opinion when designing criminal policies, shouldn’t we try to make sure that the public views those policies are based on are not just fruit of the spur of the moment, but representative of what society really wants? Importantly, in addition to helping us understand the expansion of the U.S. carceral state, the public’s punitiveness may also help explain more recent developments in the U.S. criminal justice system. As Tim Newburn has noted on this blog, some politicians and policies are beginning to reflect a shift in a less punitive direction. This shift is consistent with the declining public punitiveness observed above. In fact, if the public’s punitiveness had not declined in recent years, we would expect even more individuals would have been incarcerated. A public opinion survey reveals a substantial majority of persons harbor doubts about the effectiveness of the American criminal justice system. The nationwide survey reveals a crisis of confidence in our nation’s legal system, says the non-profit Center for Prosecutor Integrity. Public opinion on crime and criminal justice has undergone a significant transformation over the past few years. Support for long prison sentences as the primary tool in the fight against crime is waning, as most people reject a purely punitive approach to criminal justice. Instead, the public now endorses a balanced, multifaceted solution that focuses on prevention and rehabilitation in concert with other remedies. Our survey results show that this image of individual attitudes toward crime and criminal justice as hardened, punitive, and inflexible may be incorrect. Through the use of survey experiments, we find that attitudes toward crime and criminal justice depend on information and context. Depending on these factors, individual attitudes can be changed in either a more punitive or less punitive direction. The lesson to be learned is that traditional survey methods may present a biased image of what individual citizens are willing to support and tolerate when it comes to crime. According to a national public opinion poll conducted in 2007, the public is losing confidence in the death penalty. People are deeply concerned about the risk of executing the innocent, about the fairness of the process, and about the inability of capital punishment to accomplish its basic purposes. Most Americans believe that innocent people have already been executed, that the death penalty is not a deterrent to crime, and that a moratorium be placed on all executions. In April, 2009, NCCD commissioned Zogby International to conduct a national public opinion poll about American voter attitudes toward our nation’s response to nonviolent, nonserious crime. The results of this poll showed that striking majorities favor using methods other than incarceration to respond to nonserious crime. In February, 2006, NCCD commissioned Zogby International to conduct a national public opinion poll about American attitudes toward rehabilitation and reentry of prisoners into their home communities. Except where noted, the questions pertained to prisoners convicted of nonviolent crimes, such as drug or property offenses. The results of the poll showed that striking majorities favor rehabilitation as a major goal of incarceration. The public appears to recognize that our current correctional systems do not help the problem of crime, that prisoners face enormous barriers to successful reintegration to the community, and that rehabilitative services should be provided as a means of reducing crime. This paper presents experimental survey results about Americans’ attitudes towards the disenfranchisement of felons and ex-felons. Two long-term trends in public opinion provide the backdrop: strong public support for conservative anti-crime policies, and growing public support for civil rights and civil liberties for most groups. We find that 80% favor restoring voting rights to former felons once they complete their sentences, 60% support voting for parolees and 60-68% for probationers. Only 31%, however, favor allowing current prisoners to vote. In the clash between the desire to punish and the desire to protect the civil liberties of unpopular groups, we find greater public support for the latter view. A Gallup poll released today revealed that the majority of Americans — both black and white — believe that racial profiling is both widespread and unfair. The purpose of this investigation was to provide data on the experience of racial profiling that cannot easily be dismissed by those who regard the accounts of ordinary citizens as unreliable and based on a lack of understanding of police work. Although some law enforcement leaders lack confidence in the ability of the general public to identify racial profiling, it could also be argued that denials of the reality of racial profiling by White authorities are unreliable and based on a lack of understanding of being Black in America. African American police officers have the unique vantage point of having the lived experience of being Black in America along with the professional knowledge and experience that comes with being police officers. More than two thirds of the officers in our study reported having been on the receiving end of racial profiling at some point in their lives. 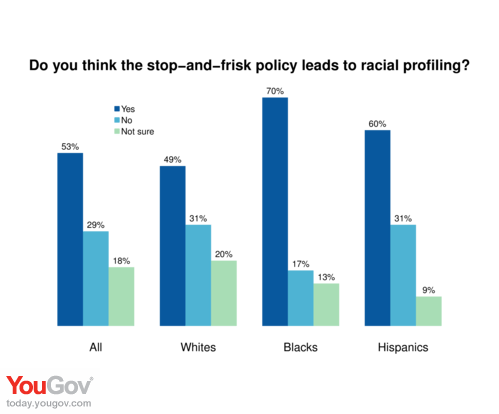 Indicating that racial profiling is not just a thing of the past, 43% of respondents said that they had experienced racial profiling in the past 5 years, and 1 in 4 reported having been racially profiled in the past year. The degree to which racial profiling is a particular problem for Black men is indicated by the fact that nearly 3 out of every 4 of the male respondents to our survey said that they had been subjected to this practice. Suggesting that dark-skinned African Americans are targeted to an even greater degree than those with light or medium skin tones, respondents who identified themselves as “dark-skinned” reported the highest percentages of having been racially profiled. Finally, despite having obvious reasons to oppose racial profiling, 1 in 10 of the officers in our survey reported that they engage in racial profiling them-selves and believe it is a necessary tool of law enforcement. The responses of the African American police officers in this survey must be added to the growing body of evidence of racial disparities in traffic stops and to the stream of first-person accounts by African Americans from all walks of life showing that racial profiling is a reality. Unfortunately, the obstacles faced by those who wish to bring an end to racial profiling include a context in which this practice is both denied and condoned. Even as police administrators deny the reality of racial profiling, they reward officers for effective use of drug courier profiles that rely on racial stereotypes. Even as the Supreme Court claims to guarantee equal protection for all citizens, it has all but condoned racial profiling by allowing police to use the pretext of traffic enforcement to stop anyone they want. Despite claims by some that civil rights for racial minorities have been achieved in the United States, racial discrimination continues to contaminate the criminal justice process.Though police officers are the gatekeepers to that process, they do not create their own marching orders. Bringing an end to racial profiling will require strong leadership dedicated to putting an end to racially biased policing in all its forms. Because of the failure of the Supreme Court to take decisive action to end racial profiling, police administrators must aggressively develop clear and direct policy guidelines that severely restrict police discretion when it comes to the use of race as a factor in determining potential criminality. These guidelines should be strictly enforced with disciplinary procedures for their violation. There must be an unequivocal message that racially biased policing will not be tolerated. The NYPD’s “stop and frisk” program is essentially a program in which black people are stopped and frisked due to their display of criminal risk factors, like being nonwhite. A shocking new poll finds that black people tend to believe there’s something wrong with the program. Overall approval for stop and frisk was at 45 percent, while disapproval was at 50 percent. Stop and frisk is a Bloomberg-era policy many voters want to amend. 58% of registered voters citywide want the next mayor to significantly change the Bloomberg policy of stop and frisk. 36%, however, want the controversial policy to continue. Seven percent are unsure. Racial differences exist. 75% of African American voters and 63% of Latino voters want the policy of stop and frisk to be overhauled. This compares with just 44% of white voters who share this view. A landmark study has found that stop-and-frisk policing leads to so much mistrust of cops, many young adults won’t go to cops to report violent crimes — even when they are the ones victimized. The study, by the Vera Institute of Justice, found a stunning correlation between those who have been stopped and frisked, and an unwillingness to cooperate with the police. For every additional time someone was stopped, that person was 8% less likely to report a violent crime, the researchers found. The Vera study surveyed 500 men and women ages 18 to 25 in five “highly patrolled neighborhoods” — Bedford-Stuyvesant and East New York in Brooklyn; Jamaica, Queens; East Harlem, and the South Bronx — who said they had been stopped at least once by cops. Of those surveyed, 46% said cops had used physical force on them, and 29% said they were never given a reason for why they were stopped. Yet most of those stopped had done nothing wrong. Of those surveyed, 85% said they were not involved in any illegal activity and were let go — a finding that matches NYPD stats that found 89% of people subjected to stop-and-frisks last year were innocent of any wrongdoing. The researchers said the experience of being stopped affects the willingness of young adults to cooperate with the police. Of the 500 people interviewed, most of whom were black or Latino, 76% said they would not go to the police to report someone they knew had committed a crime. And 59% said they wouldn’t go to cops even if they were the victim of a violent crime. Nearly 9 in 10, 88%, said residents in their neighborhood don’t trust the police. The study also found a stunning percentage of young adults who were stopped again and again. Of those surveyed, 80% said they had been stopped more than once in their lives, and 44% said they had been stopped at least nine times. Some of the young adults said they had been stopped 20 or more times. 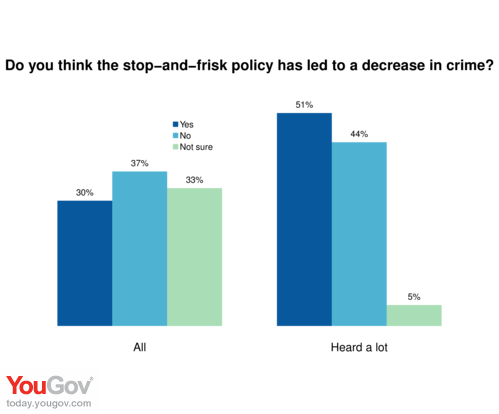 The New York Police Department’s controversial stop-and-frisk initiative may not be getting guns off the street or reducing crime, but it is certainly making an impact on public opinion. A new poll by the New York Times found that a significant majority of New Yorkers think police favor whites over blacks. The sentiment is especially strong within the African American community; 80 percent of the respondents agreed that police favor whites, compared to 48 percent of white New Yorkers. The poll also found that a majority of black New Yorkers think stop-and-frisk has led to the harassment of innocent people. Opinions about stop-and-frisk fall are divided by race. Fifty-five percent of whites described the use of the tactic as acceptable; 56 percent of blacks called it excessive. Among Hispanics, 48 percent said it was acceptable and 44 percent said it was excessive. Republicans, independents and residents of Queens generally support the practice; Democrats and Manhattanites generally deem it excessive. These views, in many cases, appear to have been influenced by personal experience. A third of the New Yorkers surveyed, including 37 percent of black people, said police officers had used insulting language toward them. A fifth of the respondents said they had been stopped by a police officer because of their race or ethnicity, and almost all were black or Hispanic, and more likely to be young and male. Besides damaging their relationship with minority communities, the NYPD has also alienated journalists and activists through the program, prompting several allegations against police officers for beating up, intimidating and arresting anyone who films them. 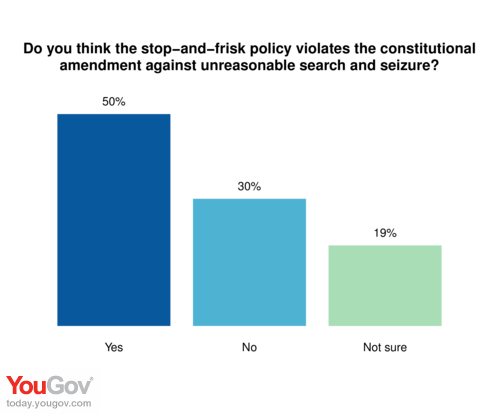 Just over one-out-of-three voters favor a stop and frisk law like New York City’s and think such a law actually fights crime. The New York City law allows police to stop and frisk anyone on the street whom they consider suspicious, but 50% of Likely U.S. Voters oppose having a stop and frisk law where they live. A new Rasmussen Reports national telephone survey finds that 36% favor such a law, while 13% are undecided. 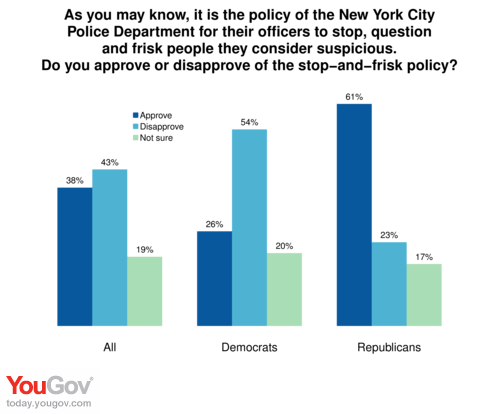 Thursday’s poll also shows that 50 percent of of New York City voters disagree with the notion that a reduction in the practice would lead to an increase in crime, while 41 percent believe it would cause crime to go up. Second, the practice has no impact on the level of gun violence in New York City, according to a recent investigation from DNAinfo.com. While the NYPD was stopping and frisking a record 685,724 people last year, 1,821 people were victims of gunfire, according to NYPD and city statistics. That’s virtually the same number as in 2002, Bloomberg’s first year in office, when 1,892 people were shot, but just 97,296 people were frisked. Third, analysis from New York Daily News shows that stop-and-frisk has no impact on NYC’s murder rate either. The city’s murder rate started dropping long before Kelly’s current tenure as commissioner, and there’s no evidence stop-and-frisk had anything to do with it. There were 2,245 murders in 1990. By 2001, the year before Bloomberg hired Kelly, the number of murders had dropped to 649. That total fell to 587 in 2002, the year before the commissioner initiated his aggressive stop-and-frisk regime. Still, apparently, those who approve of stop-and-frisk believe that if it decreased, gun crime would increase. The percentage of black, white and Latino voters who believe that is 28 percent, 39 percent, and 46 percent respectively. In the last several years, Texas shifted from building more prisons to closing prisons, saving $2 billion while, most importantly, achieving the state’s lowest crime rate since 1968. This poll shows that an overwhelming majority of Texans embrace this empirically validated approach. Whether Republican, Democrat, or independent, Texans turn out to have a very practical view of criminal justice, informed by common sense. 85 percent of Massachusetts residents polled support a reform agenda that includes a focus on rehabilitation, increased use of probation, reduced sentences for non-violent criminals and drug users, and reduced reliance on mandatory minimum sentencing. Support for these reforms rises to 91 percent when respondents learn that other states have lowered crime with similar reforms, the report stated. 2. Two-thirds want reforms that result in fewer people sent to prison, reversing previous high levels of support for new prisons. 3. Residents show little support for mandatory minimum sentencing. 4. The public sees drug use as a health problem rather than a crime, and seeks an increased focus on rehabilitation rather than incarceration. 5. Concerns about supervision cloud picture of public support. 6. In areas where more inmates are released, residents agree with the broad, pro-reform sentiment of the rest of the state. The most significant finding came when voters were asked whether the state’s three-strikes law, which passed in 1994, should be modified to allow judges and juries more discretion when sentencing a criminal for a third felony. The poll found 74 percent of voters would support allowing that discretion to ease prison overcrowding, with 24 percent opposed. Despite voters’ ambivalence over capital punishment, a ballot measure seeking to amend the three-strikes law is attracting strong support from a broad cross section, including conservatives. Proposition 36 takes aim at what critics of three strikes call its unfairest feature by changing the law so that offenders whose third strikes were relatively minor, such as shoplifting or drug possession, could no longer be sentenced to 25 years to life in prison. Ethnic groups in California want to see more treatment and rehabilitation programs in the state’s penal system and less reliance on jail time, according to a new poll of ethnic Californians on the state’s criminal justice policies. For all the groups polled, large majorities–ranging from 83 to 91 percent–believed that people with drug problems convicted for minor crimes should be sent to drug treatment programs rather than prison. Clear majorities in all the groups also thought that community service was a preferable punishment for petty crimes by strong majorities. Majorities in all the groups polled–Latinos, Asians and Middle Easterners, African Americans, American Indians and non-Latinos–feel their neighborhood cops are doing a satisfactory job. Still, majorities in all the groups ranging from 54 percent for Asians and 88 percent for African Americans also said that the system favors the rich and powerful.